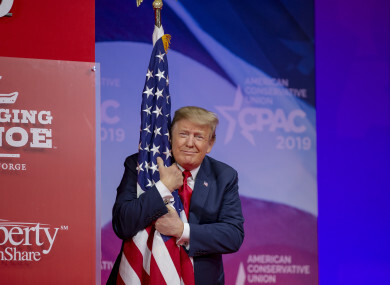 US President Donald Trump hugs the US flag during CPAC yesterday. US PRESIDENT DONALD Trump rallied right-wing activists yesterday with a speech touching on immigration, trade and the threat of “socialism”. “We believe in the American dream, not in the socialist nightmare,” he said to applause from hundreds of supporters at the annual Conservative Political Action Conference (CPAC) near Washington. “America will never be a socialist country,” Trump added in a mammoth two-hour speech that seemed to draw energy from the fervent reception offered by some of his influential supporters in the room. It was his first public appearance since coming home empty-handed, and to criticism from all sides, after a nuclear-disarmament summit with North Korea’s leader Kim Jong Un. He told CPAC the meeting was “very productive” – but that he would not “make a deal just for the sake of doing it”. The White House is also smarting from explosive testimony on Capitol Hill by Trump’s former lawyer and fixer Michael Cohen on Wednesday that branded him a cheat and a racist. He said progressive healthcare policies would “lead to colossal tax increases” – and accused the Democrats of having “totally abandoned the American mainstream” on issues such as immigration and abortion. With the federal investigation into possible collusion between the Trump campaign and Russia reportedly approaching its conclusion, Trump again berated Special Counsel Robert Mueller’s team as partisan hacks out to get him, adding that “these people are sick”. His voice dripping with sarcasm, he suggested that his call in summer of 2016 for Russia to find and release Hillary Clinton’s emails was a joke that had been obtusely taken at face value by the media. On the foreign front, Trump repeated his claim that the last Islamic State group fighters in Syria would be captured or killed imminently – “as of tomorrow”. On Thursday he told US troops “we just took over” 100%of the caliphate. Trump regularly ignores the dominant US services sector to focus only on goods, when in 2017 the US trade deficit with China was actually $337 billion – not $500 billion. Trump last year initiated a tariff war with Beijing, which has taken a nasty bite out of US growth. The beauty is this. I have $250 billion more to put tariffs on. The word “socialism” has been in heavy rotation since some Democratic candidates began openly embracing liberal platforms including the Green New Deal and a Medicare for All. On Friday, Vice President Mike Pence spoke at the four-day conference in National Harbor, Maryland, to warn that Democrats are taking a “hard left turn” ahead of 2020. “Under the guise of Medicare for All and a Green New Deal, Democrats are embracing the same tired economic theories that have impoverished nations and stifled the liberties of millions over the last century. That system is socialism,” he said. Trump’s speech came at the same time Senator Bernie Sanders, who has embraced the label of “democratic socialist,” spoke at a rally in New York, assailing Trump as “the most dangerous president in modern American history”. It was Sanders’ first major speech since announcing he will again seek the Democratic presidential nomination in 2020. Republicans hoped Trump’s address would serve as a diversion from the Mueller investigation and to the testimony this week on Capitol Hill by the president’s former personal lawyer Cohen implicating him in crimes. In December a court sentenced Cohen to three years in prison for hush-money payments to two women and for lies to Congress – both of which he said were to protect Trump — and tax evasion. Email “Trump gives mammoth two-hour speech attacking Democrats, 'socialism' and the Russia investigation”. Feedback on “Trump gives mammoth two-hour speech attacking Democrats, 'socialism' and the Russia investigation”.